Poseidon Expeditions was founded in the U.K. in 1999 with its main office located in Moscow. From the beginning, the company has specialized in icebreaker cruises to the North Pole. The first North Pole cruise took place in 2001 aboard the 100-passenger Yamal. In 2003, cruises aboard the Kapitan Dranitsyn ventured to Spitsbergen and Franz Josef Land. The next year saw the company journey through the Northeast Passage aboard Yamal. Cruises to the Russian Far East followed. The company operated the icebreaker 50 Years of Victory to the North Pole in 2008, the first season the ship was available to tourists. Looking south, the company began marketing expedition cruises to the Antarctic Peninsula aboard the 116-passenger Sea Explorer in 2013. Sea Spirit entered the picture in 2015 when Poseidon Expeditions took over charters of the upscale ship from Quark and offered trips to both Antarctica and the Arctic, including Iceland, Greenland, Spitsbergen and Franz Josef Land. Sea Spirit received the first-ever permit to cruise into the territorial waters of Franz Josef Land without first calling at a mainland Russian port. Presently, Poseidon Expeditions is the only company offering voyages to Franz Josef Land from Svalbard (a Norwegian Arctic archipelago). The company has expanded its offices to include the U.S., U.K., Cyprus, Germany, Russia, China and Japan. Rugged icebreaker or luxury yacht, life aboard a Poseidon Expeditions sailing is casual, though not laid-back. There's much to see and do, with sightseeing and shore excursions by Zodiac that require plenty of clothing changes and bundling up. Wildlife viewing, be it penguins and whales down south or polar bears and walrus up north, often takes place from the decks (more warm coats needed). Another plus are the expeditions leaders -- a dozen or more experts in marine biology, ornithology and geology -- who give fascinating presentations during sea time. There's a well-stocked library, as well. Among the more adventurous activities offered are kayaking or a chilly polar plunge. During North Pole expeditions, passengers might have the chance for an overview of the icy terrain from a helicopter. They'll also disembark to enjoy a barbecue near the pole at 90 degrees north and are often able to join a volunteer research program that collects data from sea ice. While English is the primary language spoken by guides and staff, no one need feel left out of lectures or briefings. Poseidon stands out in offering a QuietVox translation system for non-English speakers. Travel to bucket list polar destinations draws a mix of passengers from around the globe, including the U.S., Europe, Australia, Japan, China and Russia. While the majority tends to be 50-plus couples, the ships are seeing more multigenerational family groups. Single travelers willing to share are also becoming more numerous, not to mention younger. The holidays, in particular, see a younger set and more families. No matter their age or nationality, passengers are of one mind in the goals of having memorable wilderness experiences and becoming true polar adventurers. Like a number of polar expedition cruise companies, Poseidon Expeditions charters ships for exploration of the Antarctic, Arctic and North Pole. Among the ships in the chartered fleet are 50 Years of Victory, a 128-passenger nuclear-powered icebreaker built in 2007. It can break through ice that's 9.2 feet thick, and it has a helicopter for sightseeing flights. All cabins have exterior views and private facilities. There's a gym and seawater pool. 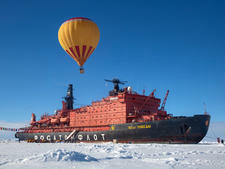 The icebreaker is chartered from the Russian government for two or three summer voyages to the North Pole with several days in Franz Josef Land. Located north of mainland Russia, this Arctic Ocean archipelago consists of nearly 200 islands with much of the terrain covered in glaciers. In contrast to the icebreaker is the more luxurious, 114-passenger, all-suite Sea Spirit. The ship was built in Italy in 1991 and originally sailed as Renaissance V, then sailed in Alaska for a decade as Spirit of Oceanus. The 4,200-ton, 297-foot ship was renovated in 2004 and the hull was ice-strengthened in 2010. It has a fleet of Zodiacs and retractable stabilizers for smoother sailing in the Arctic during summer months and Antarctica in the Austral (Southern Hemisphere) summer.